Rolfer, therapist and lecturer of studio Aithér. Offers a secure, helping hand in solving your health problems, such as back pain or musculoskeletal pain, as well as other health pain and problems.If you wish to improve your body posture, orientation, coordination or efficient use of your musculosceletal system and your body as a whole, you are welcome to visit him. He will lead you through a safe and the most sensible way to experience the inner most felings of freedom without any pain, which your body will be able to incorporates into your daily life, and thus regains greater freedom and sphere not only related to motoric senses. If you would wish, you could learn new movement patterns, attitudes and meanings of gestures, which will have a positive affect on your whole experience, as well as your future life. He finishe his Ph.D. studies at Czech Technical University in Prague, graduated from Artificial Intelligence and Biocybernetics. He still continues his research in field of biomedical engineering and fascia reseach, connecting his body work and scientific experience. 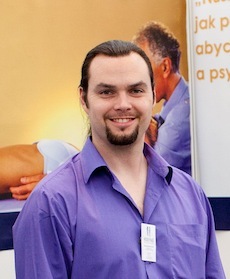 He passed the Basic Rolfing training in ERA (European Rolfing Association) in Munich. He has been doing the body work and healing from 1999 and still continues in his learning and development to be more efficient to help people around.